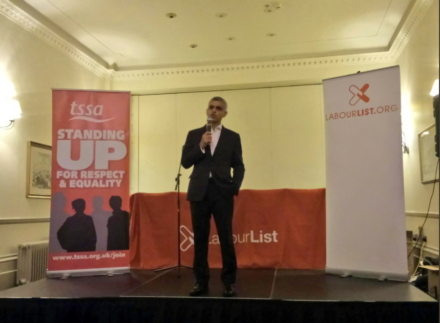 Sadiq Khan delivered an impassioned defence of the contribution of migrants to British life last night as he headlined a special LabourList/TSSA rally at party conference. The London mayor said his city was the “greatest in the world” because of its ability to attract people to come to work here. He also warned of the “hatred” unleashed by the EU referendum campaign last year and condemned Theresa May for using migrants as “bargaining chips”. Khan was the headline act at the rally, in Brighton, which attracted hundreds of people. He spoke alongside prominent from across the Labour Party, including TSSA general secretary Manuel Cortes, MP Alison McGovern and journalist Maya Goodfellow, on the day it was confirmed there would not be a full Brexit debate at party conference. “I am mayor of the most diverse city in the world,” Khan said. Khan, the son of a Pakistani bus driver, highlighted the progress made since the 1980s, when signs saying “No Irish, no blacks, no dogs” were frequently seen on pub doors in the capital but warned of a rise in hatred over the last year. “The trade unions and the Labour Party campaigned to change the law [30 years ago]; we changed the law. Cortes, who has been a strong backer of Jeremy Corbyn, criticised the decision by Labour’s conference arrangements committee not to include a full discussion on Brexit – which he described as the “biggest issue facing the country” – on the floor of conference and vowed to press on with the effort to defend migrants. “We will continue to fight. Our trade union has a proud record of standing up for people,” he said. “We do not stand on the other side .We stand shoulder to shoulder with our brothers and sisters [from the EU].